complete suite of services, the various e-book platforms Kobo and Kindle. 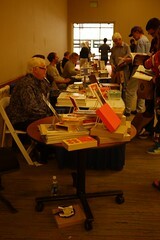 Also a number of authors who have done both traditional publishing and also self-publishing. They provided a lot to think about, with the various options available. They emphasised the importance of marketing, including the design of the cover. It has to be something that looks good the size of a postage book, as well as on the book, because that’s what appears on Amazon. Get it done by a professional if possible. Similarly if you can get a professional edit, certainly a copy edit/proof read (although I’m not sure what the difference is, except that one happen before the book is in galley form and the other after). I’ll come back to this when I’ve had more time to think about it, but it did confirm for me my decision to take the self publishing route. Thank you to Authoright for organising this event. As one of those who spoke on a couple of the panels I agree that it was a very positive event. One site I would recommend is Awesome Indies. They support Independent authors but insist that if you submit your work to them it needs to be as ‘up to scratch’ as any traditionally published novel. They use professional copy editors and proof readers and if it is lacking in formatting, grammar, punctuation etc they won’t be shy in telling you! However, it’s a good process because it gives writers the incentive to get their work as ship-shape as possible. They will let you go away and redraft and re-submit until their ‘seal of approval’ standard is met. It also lets readers know which Indie novels are recommended, not just by their literary content but by their overall professionalism. They deserve a lot of support. Authorlounge at LBF was pretty packed throughout… and is clearly here to stay. Good luck with your own writing journey.